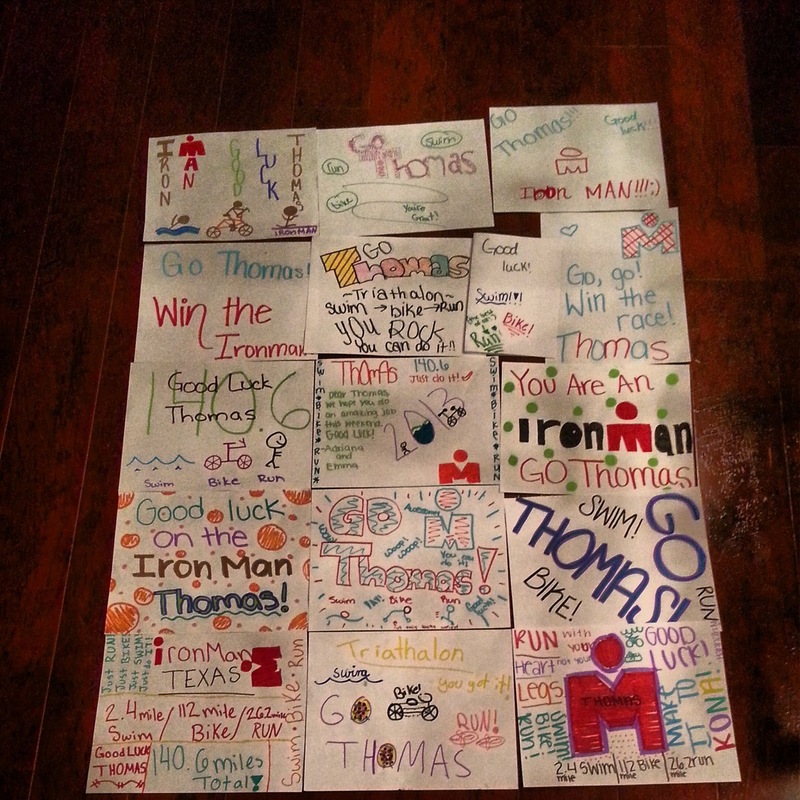 The CC gals at McCullough Jr High made me some race inspiration!!! summer training. In case you hadn't seen, I did attempt Ironman Texas yesterday and although I felt pretty good out there, it just didn't make good business sense to continue the race. In the end I would swim (57:51), bike (4:34:27), and do a ~9 mile loop on the run before calling it a day and cheering on the rest of the professional field including male winner Paul Amey and female winner Rachel Joyce. To be honest, I got exactly what I needed out of the day - nothing more, nothing less. There were many factors that went into my decision to pull the plug on the race, but ultimately, the biggest one is that it just wasn't the focus of my race season and I simply wasn't in a great position coming off the bike. Going into the race, I already knew what type of race it was and what to expect and as expected it didn't disappoint. In this case, the course, field size, and tactics favored the swim, leading to a less than important bike on a relatively flat course. I certainly expected people to crack on the run with the brutal heat, and although I felt confident I could run up to a top 8 finish, it just wasn't what I wanted and I certainly wasn't looking forward to the 6 week recovery that would come from smashing myself in the last 30K of the run. I did want to give special thanks to the Collins family for providing a fabulous homestay along with Atomic for giving my bike some TLC to make sure I could go as fast as possible on the bike while spending as little energy as possible. My week leading up to the race was chalk full of adversity, but both the Collins family and Atomic really helped to counterbalance all of it. As for my training this week. It was pretty limited and what I did was ad-hoc given that I was in move mode. I will say that I purposely ran at 1 to 2pm on Monday and Tuesday (102 when I finished) and then drove across the country without AC. And of course since I have to know a little something about aerodynamics, the windows stayed up. The drive was brutal, but on race day I did not even notice the heat and humidity. It was super-acclimation at its finest. As I said, when I pulled the plug on the race I felt great and I feel spectacular as I write this.